Rumors swirled over the weekend that NASA was hiding something. Here’s what’s actually happening. If you were on Facebook this weekend, you may have seen an image showing a mysterious blue sphere in space and a whole bunch of conspiracy theories about it. Aliens? NASA cover-up? As usual, the truth is much more mundane. 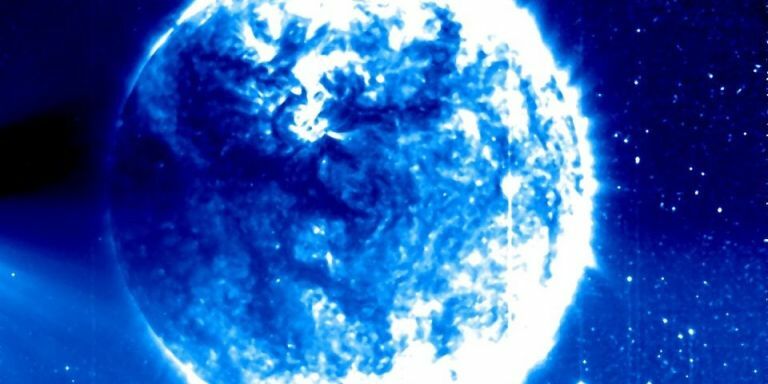 One of the cameras on NASA’s Sun-observing STEREO spacecraft, which normally just shows an empty field of stars, captured a giant blue sphere for a few frames before it vanished. Many people on the internet got very excited about this after UFO hunter Pamela Johnson shared the pics on Facebook. Some tabloids like the Daily Mail wrote entire articles speculating about what this giant blue sphere could mean. Theories ranged from rogue planets to holographic images to all kinds of conspiracy theories. 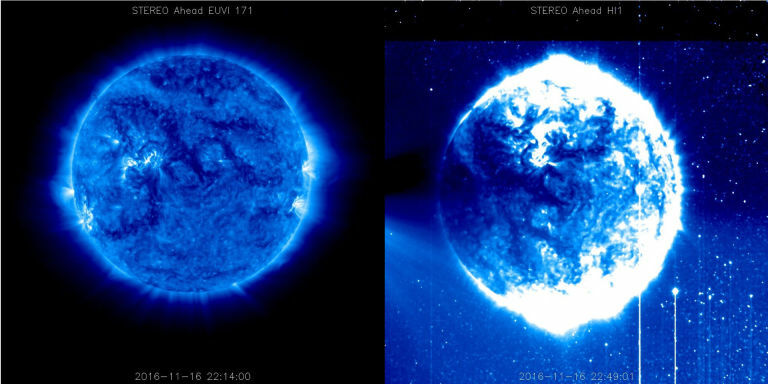 On the left is a normal image of the Sun taken by the EUVA camera. On the right is that same image, flipped, rotated, and layered on top of an image taken by the HI1 camera. Onboard NASA’s STEREO spacecraft is an instrument called SECCHI. Basically, it’s a big box with five different cameras in it. Three of those cameras point directly at the Sun, while the other two are pointed at the space between the Sun and the Earth. They all observe different things, but when the data from those cameras are sent back to Earth, the images from all the cameras get bundled together in one package to save space. Normally, the computers that receive those images are able to separate them just fine. But sometimes that data can get scrambled and the images get messed up. This means that sometimes the images show up flipped, or rotated, or jumbled in other ways. “That’s exactly what’s happening here,” Young says. In this particular case, the images from two different cameras were layered on top of each other. An image from the EUVI camera, which looks at the Sun, got flipped, rotated, and superimposed on an image from the HI1 camera, which looks at the stars. And so, for a few frames, it looked like a giant blue sphere appeared in the middle of our solar system. As is the case with most NASA telescopes, raw images automatically become publicly available once they’re sent back to Earth (because NASA is taxpayer-funded). The agency would remove a goofed, glitchy image like this, but it didn’t get around to it before the picture started making the rounds on the internet.